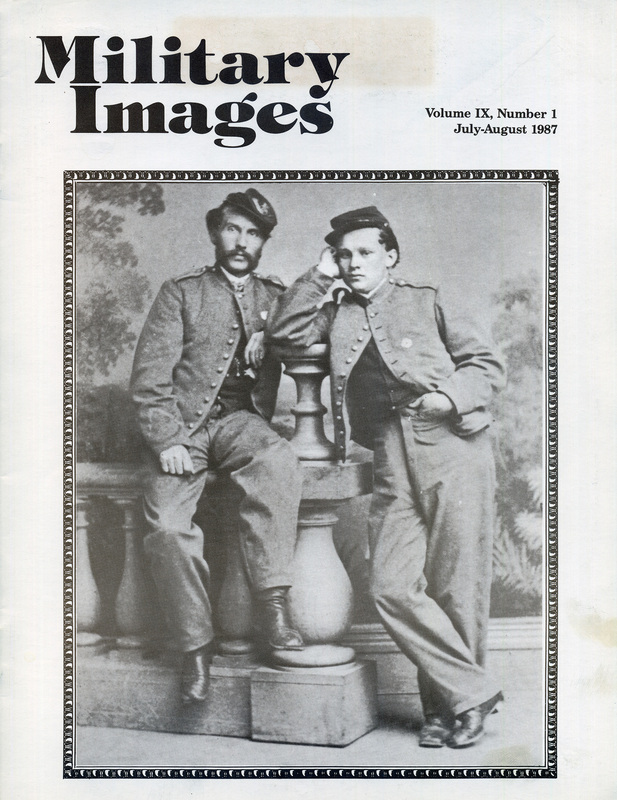 The cover of this issues of Military Images features a carte de visite image of two compatriots working for the Veteran Reserve Corps. They wear the XXII corps badge that indicates their service in the defense of Washington, D.C. The editor discusses the loss of the Chantilly Battlefield site to development, and supports the protection of the Antietam site from the same fate. There are seven publications offered for review in this issue of MI beginning with Illustrated Catalog of Civil War Military Goods by Schuyler, Hartley & Graham, an unabridged reprint of the 1864 catalog by the aforementioned New York firm. Next under review is Carl Bornemann’s Regiment, the 41st New York Infantry (DeKalb Regt.) in the Civil War by Dr. David G. Martin, which outlines the history of one of the regiments of “cowardly Dutchmen” which shows they were anything but. Some diary entries, photographic images, and sketches as well as some short biographies of regimental officers are also included. Civil War Generals: Categorical Listings and a Biographical Directory is compiled by James Spencer and shows the kind of database listing that could be compiled with the use of a computer at the date of publication of this issue. The Official Records of the Union and Confederate Armies is offered in 128 volumes and The Confederate Veteran in 40 volumes are made available by the Broadfoot Publishing Company, providing the essence of basic research information on the Civil War. These volumes are of considerable value to those doing extensive research on the course of the Civil War. Civil War Books: A Priced Checklist is compiled by Tom Broadfoot, Marianne Pair, and Roger Hunt, providing the collector of books a means to find a book’s comparative value. The checklist includes over 7000 titles in 10,000 volumes. Next in review is British Military Longarms, 1715-1865 by D.W. Bailey, providing an excellent overview of this very popular Confederate and second popular Federal firearm, as well as information from the Revolutionary and antebellum eras as well. Finally, the publication Why the South Lost the Civil War by Richard E. Berlinger, Herman Hattaway, Archer Jones, and William N. Still, Jr. is reviewed. The authors state that the South did not need to end the war as they did at Appomattox, but for three factors: absence of a sense of Southern nationalism, a religious belief that led to a sense of defeat/guilt, and a change in the nature of the government in Richmond. The reviewer sees the book as more of an “academic” work as opposed to a historical work. Having entered the military in September 1862 at age 37, leaving his only daughter behind, Philip Decker enlisted as a sergeant in the “Mountain Legion,” Company E of the 156th New York Volunteer Infantry. By the time they left the Western part of the war and moved into the Eastern Theater in Virginia in the summer of 1864, their battle flag had been torn and tattered, in some cases pieces were pinned together. The “Mountain Legion” was just starting to get into line of battle before dawn at Cedar Creek when a number of other VIII Corps soldiers burst through their lines, followed by the Confederates of Kershaw’s 53rd Georgians. The color bearer went down as firing came at them from front and flank; Decker reached for the colors and made his stand at two Georgians with their own colors tried to wrest the banner from Sgt. Decker. He pulled the silken fabric from the standard, leaving the Georgian with the staff. Decker was downed by a shot in the elbow, giving up the colors to his captain, Alfred Cooley, who passed the tattered silk to Brig. Gen. Alfred Neafie, who carried the colors on his saddle for the remainder of the fighting at Cedar Ridge. Neafie sent the remnants home to his wife; the flag was eventually sent back to Cooley who kept it until it was dedicated at a reunion and dedication of the 156th monument at Highland, NY in 1908, with Sgt. Decker taking part in the ceremonies. The “Iron Brigade” was made up of soldiers from Wisconsin, Indiana, and Michigan and citizens from those states commissioned Tiffany & Co. of New York to create a flag for the regiment. The article describes the details of the flag, from its rich dark blue silk to flags designating major battles through Gettysburg. The story of the flag’s presentation is told as well, with the ceremony being delayed a few days from its original anniversary of Antietam as the unit was called away to fight in Culpeper, Virginia. It is currently held in the War Museum of the Wisconsin State Capitol in Madison. 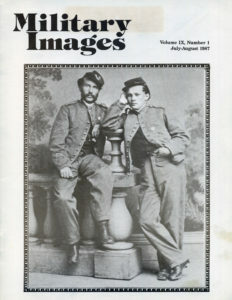 The feature begins with a pair of pairs – one pair of militia or early Civil War musicians in a sixth-plate ambrotype sharing the page with a pair of images of Sergeant and Mrs. Abraham Cole of the 61st New York. “Pop Quiz #321” asks readers to identify an outdoor image, which would be easy for anyone from the Baltimore area. And three stragglers are presented as not quite what they seem to be; all are purported to be images of a hussar, Civil War wounded, and a pair of Confederates. They are probably images of actors, rather than the reality they purport to show. A war-weary image of a soldier in a sixth-plate tintype.